LAS VEGAS -- It has been more than two years since the legendary Manny Pacquiao, boxing's only eight-division world champion, fought in the United States. But the Filipino senator is back. In his first fight since signing with adviser Al Haymon's Premier Boxing Champions, Pacquiao will defend his secondary welterweight world title against former four-division world titlist Adrien Broner on Saturday (Showtime PPV, 9 p.m. ET) at the MGM Grand in Las Vegas. "People say I appear happier this fight. I am happy. I'm so excited to be back in the U.S. to fight again," Pacquiao said. "Everyone has been so good to me here; it's like a second home. I'm getting very excited for Saturday night, and I'm ready for Broner." Broner is 0-1-1 in his last two fights, and he has lost whenever he has faced elite opponents, having dropped decisions against Mikey Garcia, Shawn Porter and Marcos Maidana. He hasn't done a thing to earn the fight with Pacquiao but he is a draw, with a big personality and a well-known name. That's why he is here. Despite Broner having won four world titles, many consider him an underachiever. He knows a win over Pacquiao can significantly change the perception of his career. "This is going to be a hell of a fight. I've trained so hard and I want everyone to know that I play around a lot, but when that bell rings, I'm going to be ready," Broner said. "I didn't come here to lose or lay down. I came here to get this victory. Real talk. "I'm just excited I'm the underdog and I know there are a lot of people that are here to see me lose. I'm so focused that I don't feel any of this hype surrounding the fight. This just starts another chapter in my book. I'm still writing my story and it's going to have a happy ending." Pacquiao (60-7-2, 39 KOs) enters his first fight since turning 40 on Dec. 17. He's had a long career filled with numerous hard fights, but he still looked strong and fast when he knocked out Lucas Matthysse in July to win the secondary belt he currently holds. Pacquiao said he has made a few concessions in training due to his age, such as giving himself a little more time to recover from a hard workout if he needs it, but he said he still feels good and hopes to continue his career into his 40s. "This is a challenge because it is my first fight as a 40-year-old," he said. "I have something to prove to everyone about what that means. Age is just a number. What matters is how you prepare and that you're working hard -- 40 is just a number to me. My sparring partners are in their mid-20s." "I still have that killer instinct and the fire in my eyes is still there. That aggressiveness, the interest in this career is still there 100 percent. The speed, the power are still there." Roach said Pacquiao still trained as hard as ever. "Manny will prove that life begins at 40. It's not just his age, but also the number of times he will have won a fight by knockout," Roach said. "Manny's power, strength, speed and smarts are still at an ultra-elite level. Our only concern has been overtraining. We [didn't] want him to peak too soon. His work ethic in the gym is unparalleled. He is totally focused on destroying Broner. No one in boxing will outwork Manny in the ring. He's boxing's version of Nolan Ryan. Ryan was throwing no-hitters and leading the league in strikeouts after age 40. Manny still throws the heat like he did in his 20s and 30s." Broner (33-3-1, 24 KOs), 29, of Cincinnati, said he didn't want to hear about Pacquiao's age. 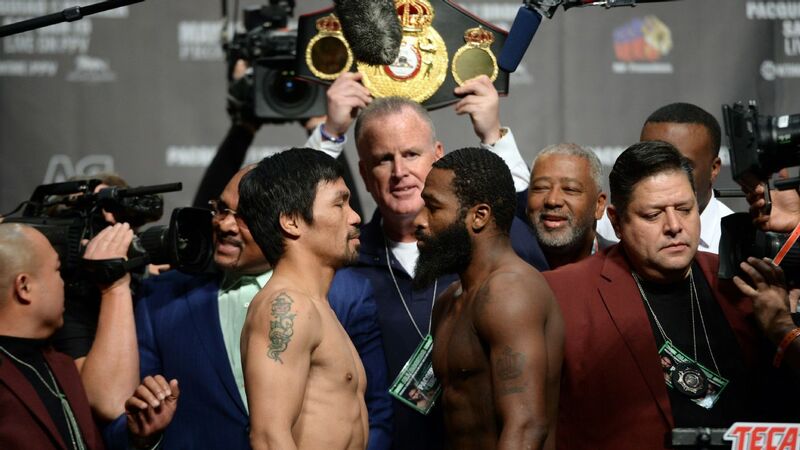 "A lot of people are saying that Pacquiao's age will be a factor, but I'm not looking at it like that," Broner said. "You see guys like Floyd Mayweather who stay undefeated at an older age. I'm just focused on being me. As long as I do what I have to do, I will be victorious." After Pacquiao, a southpaw, lost a hugely controversial decision and his welterweight belt to Jeff Horn in Australia in July 2017, longtime trainer Roach suggested that Pacquiao -- who didn't look very good in the fight despite most believing he had won -- should consider retirement. The comments upset Pacquiao, and when he planned his next fight against Matthysse, Roach was never contacted about training him. Instead, Pacquiao promoted best friend and longtime assistant trainer Buboy Fernandez. Roach had been fired and was supremely disappointed, though he was pleased to see Pacquiao win by seventh-round knockout -- his first KO in nine years -- and claim a secondary welterweight belt in his absence. Pacquiao and Roach had been like brothers and reached glorious heights during their 16-year, 34-fight run, during which Pacquiao won fighter of the year honors three times and was named 2000s fighter of the decade; Roach won trainer of the year honors seven times. Their fractured relationship was mended when the Pacquiao-Broner media tour hit Los Angeles this past fall and Pacquiao called Roach -- the first time they had spoken since the Horn fight ended -- and asked him to meet him at his hotel. Roach drove over for the meeting and Pacquiao apologized. Roach accepted, chalking the situation up to "water under the bridge." Roach was quickly welcomed back to camp and corner, where he is sharing duties as co-trainer with Fernandez, who was also happy to have his mentor back. Pacquiao said both trainers are important to him and they handled the camp as they always have. "Freddie's never out of Team Pacquiao," Pacquiao said. "It just happened that I wanted Buboy to experience being a head trainer in one fight. But it's a good thing that we're working here again. I think that it's good for us to be united and focused for this fight." Roach said after the meeting to smooth things over, it was like nothing had ever happened. "Manny and I have been together  years, so I had no reason to ever be mad at Manny," Roach said. "Everything has worked out really well and we're working together as a team right now." Pacquiao added: "Me, Freddie and Buboy know each other well and we have a great coaching staff right now. I'm happy with how everything has gone in training for this fight." 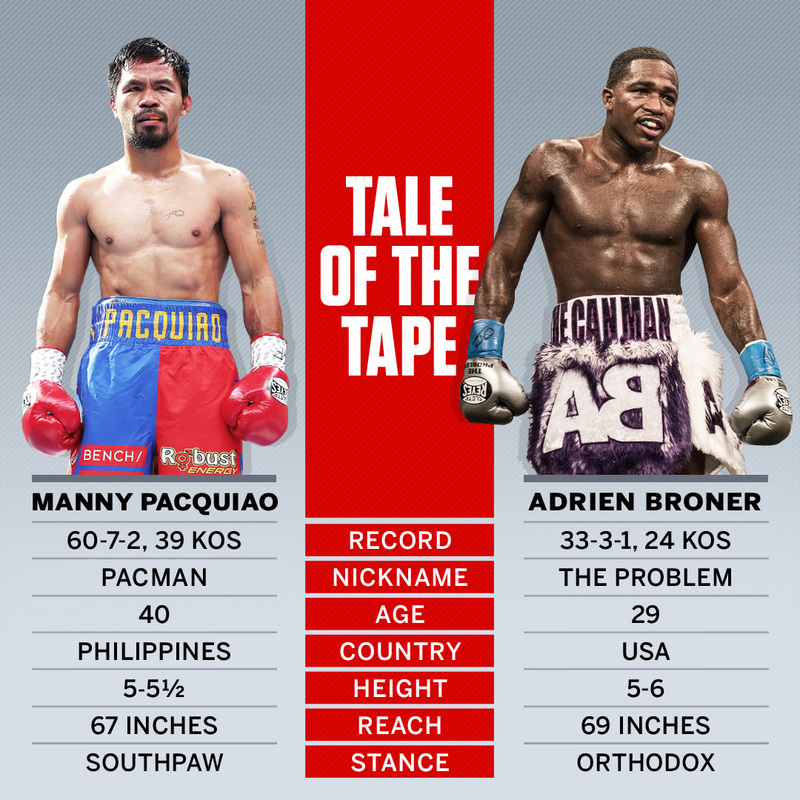 Although Pacquiao is facing Broner, there is the specter of a possible rematch between Pacquiao and Mayweather. Mayweather won a decision in their 2015 welterweight unification fight -- the richest fight in boxing history with more than $600 million in revenue -- and the possibility of a rematch has been a big part of the buildup to Saturday's Pacquiao-Broner fight. Pacquiao and Mayweather (whose Mayweather Promotions is one of the promoters of Pacquiao-Broner) met in Japan last fall and talked about a rematch, which many believe is possible later this year if Pacquiao beats Broner. It would likely be another nine-figure payday for both men. Pacquiao is game for the rematch. "When I met up with Floyd in Japan, we talked and he said he wants to come out of retirement to challenge me," Pacquiao said. "Floyd has come out of retirement [in the past] and we'll see after this fight, but we cannot underestimate Broner and this fight. We will discuss anything with Floyd Mayweather after that." Broner has clearly been annoyed by all the talk of the possible rematch. "People are talking a lot about Pacquiao fighting Floyd Mayweather again, but I'm pretty sure Floyd is retired," Broner said. "I feel like people are trying to throw me to the wolves and overlook me." On New Year's Eve, Mayweather scored an easy first-round knockout of Japanese kickboxing star Tenshin Nasukawa in a boxing exhibition outside of Tokyo. But after the fight, he said he was not interested in boxing again, at least not in a real fight. Leonard Ellerbe, the CEO of Mayweather Promotions, said he does not believe Mayweather is interested in another Pacquiao fight. "He's retired. If that was something he was interested in doing, he would be doing this fight on Saturday night," Ellerbe said. "I don't think he's interested. That's just my opinion. He's very comfortable living an extraordinary life. He's worked hard and he's enjoying the fruits of his labor. I don't think he misses the rigors of training and the preparation. I don't think he's interested. I don't think he's thinking about fighting no more. He's living his life. He's retired and he's not thinking about fighting Manny Pacquiao or anyone else at this particular time. If he changes his mind and wants to do something else, he'll let me know." Broner legal issues an issue? Broner has had numerous legal issues through the years, including stints in jail. He has two criminal cases that have been going on during his training camp, including hearings on the same day earlier this month -- one for a sexual battery charge in which he was accused of groping a woman at an Atlanta shopping mall, and one stemming from an outstanding warrant issued in relation to a 2017 traffic incident in Florida. He also was recently sued for $1.152 million by a New York jeweler for failure to pay his tab. Given the usual chaos of his life, Broner said those issues did not impact his ability to focus on his training camp with trainer Kevin Cunningham in West Palm Beach, Florida. "That's just something I'll take care of after the fight," Broner said of the legal problems. "Right now, I'm 100 percent focused on this fight and I'm just ready to come to the ring and get a victory." Rafael's prediction: Pacquiao by decision.